Learning to cope with the negative emotions is the main reason that young people manage to stop harming themselves. Heads Above The Waves’ workshops introduce creative coping techniques as an alternative to self-harm. Aimed at students in years 7-11, this set of 4 workshops will introduce the concept of positive alternatives to self-harm, encourage honest and open conversation, and plant the seeds for self-help. A creative coping technique, based on something that’s helped someone overcome self-harm in the past (including art, music, writing, and meditation). To give students a chance to explore their feelings and experiences. Students reflect each week on different aspects of their lives and identify where they are harming or caring for themselves. 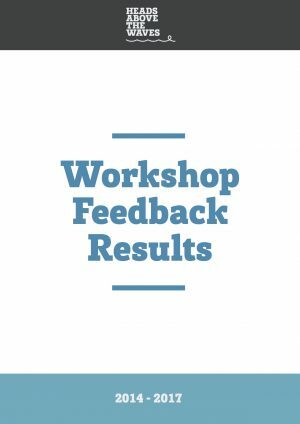 At the end of the 4 workshops, students are able to see their progress, and any persistant issues can be followed up by staff. Following up on the activities and discussions from the week, and signposting students to further support. Workshops are run on site in the school, and can take place during lunchtimes, after school, or (for best attendance) during PSHE sessions. Each session lasts for an hour and a half. We can deliver a general assembly to all students to introduce the concept of coping in healthy ways, and then follow up with the workshops aimed at students specifically identified as struggling with self-harm issues. Note: These workshops are not intended to replace counselling or sound medical advice, but to act as the starting point for recovery from self-harm. Out of 7 students with a history of self-harm who attended workshops at St. Teilo’s School, Cardiff, none of them had self-harmed within 3 months of the workshops.